In a time when discussions about how to scale agile are front and center there are many variations and approaches to consider. Some popular scaling frameworks are Scaled Agile Framework (SAFe), Large Scale Scrum (LeSS), and Disciplined agile Framework (DaD). Today we will examine one element of the LeSS framework, and that is the “Overall Retrospective” model. In general, it is widely accepted that the LeSS framework is much more lightweight than SAFe. And as with any framework, you don’t necessarily need to adopt every element therein, but that doesn’t mean it hurts to examine components with a critical eye. According to LeSS’s guide “The Overall Retrospective is a new meeting in LeSS. Its purpose is to discuss cross-team, organizational and systemic problems within the organization.” This is similar to a “scrum of scrums” but with a retrospective spin. So, can you and your organization find value by leveraging “Overall Retrospectives”? Let’s look a bit deeper and find out. Cross-team collaboration – it is very common for teams to only be able to take their growth so far until they hit cross team or organization-wide challenges. Encouraging and providing a model for cross-team retrospectives is a big win and something many companies could majorly benefit from. Tools provided – the model outlined in the LeSS model tees up very nicely a model that is to the point and gets to the heart of issues. The article says “An important tool for Overall Retrospectives is to use Cause-Effect Diagrams. Having the participants pick an issue and explore the different causes together in front of a whiteboard can lead to big insights and real, useful changes.” These type of methods are great to make retrospectives less subjective and move towards identifying real for experimentation and continuous improvement. PO role – One thing you could not like about this model is that it distinguishes the PO as a separate entity from the team. This may not be the intention, but when the PO is designated as a separate piece apart from the team, it can create a dynamic on a team of “us and them”. I’ve found it helps to message and position the PO as a “peer leader” of sorts that is an equal on the team. This means that POs should be a part of their team’s retrospective. 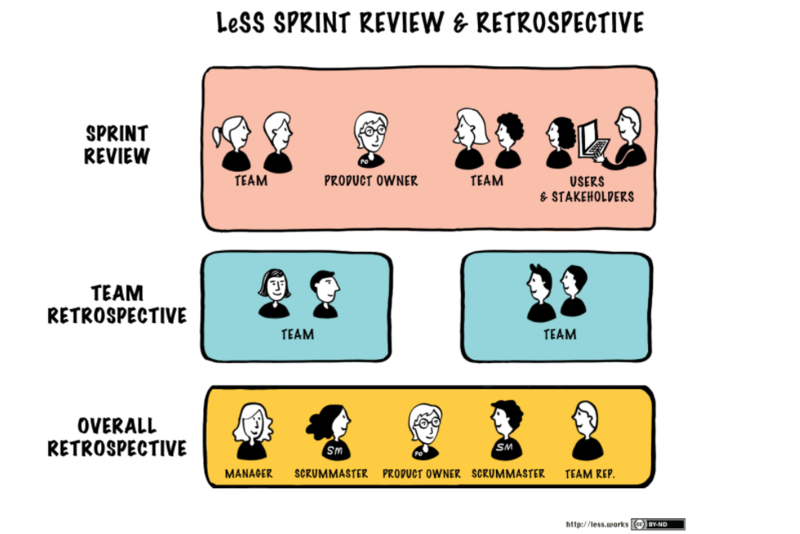 Product Ownership is such a critical component of a successful agile team, that having that role only active in cross-team retros would be missing many opportunities for growth. Managers & Retros – Not including managers in a retrospective typically is a signal of some kind of safety issue. Aside from this model, I’ve seen many teams hold two variations of their retro: one with management and one without. I think creating MORE meetings rather than addressing the behavior of a leader that doesn’t foster safety is counter-intuitive to the principles of LeSS. That being said, I am a fan of taking realistic steps forward so the dual phase retro can serve a purpose if the long-term goal is to groom leaders that can be present at a retro and have teams feel comfortable. I’ve also found that when treating managers as agile leaders it is important for them to attend retrospectives so they can take away action items to help support the team. If a manager spans multiple teams it could make sense for them to not be present at a team’s retrospective. I realize this may be counter to the popular belief in many agile circles, but take some time to consider if keeping managers in a silo away from the team is solving the right issue. If your organization is struggling with cross-team collaboration “Overall Retrospectives” could prove to be a tremendous resource. As with any tool or process, you will want to carefully evaluate how to customize it for maximum benefit and minimal waste. LeSS is seeking to solve all the right problems with this process, but you may want to reconfigure the attendees at each level of retrospectives. Do you have experiences using this format or something similar? If so please do share in the comments!